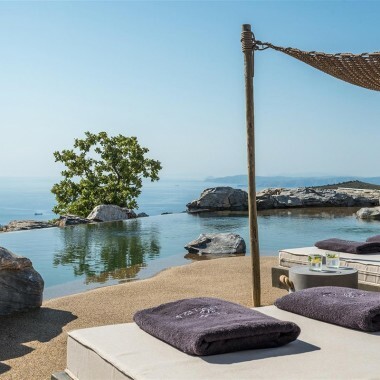 This luxurious, beautifully designed villa for rent is situated at Kabi, in the area of Koundouros, in the south of Kea island. It is just five minutes walk from a quiet and sandy beach, and 25 kms from the port of Kea. 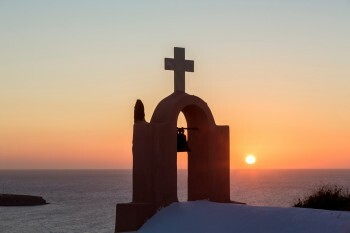 Kea is the closest of the Cyclades Islands to Athens (about 55 minutes from the port of Lavrion – Athens). 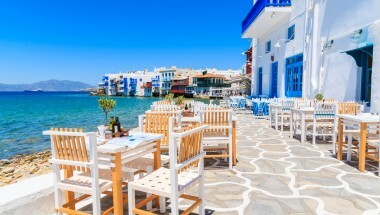 It is a popular destination for its proximity to Athens, its stunning villas, and its unspoilt beaches. It is also popular as a stopping point for yachting holidays. Kea is reached via Lavrion port (about 40 minutes from Athens by car, bus or taxi). It is then a 1 hour trip by boat to Korissia port, which is about 10 minutes’ drive from the villa. We recommend you hire a car at Athens airport, which you can then take on the boat to Kea. From its location in Kea high above the sea, there are wonderful views from this luxury villa for rent and its vast terraces. Built on two levels, there is a swimming pool at each level, an L-shaped pool and a lap pool, as well as an outdoor Jacuzzi and a sauna. The wide terraces are perfect for relaxing and entertaining outdoors, with a pergola covered barbecue and large dining area, and comfortable chill-out areas with sofas and sun loungers. There is also a newly built lap pool. Built of stone, and with large glass windows allowing for maximum light, the villa blends in perfectly with its environment. Many of the rooms have exposed stone walls and are furnished beautifully in neutral colours in a minimalist style. Amenities include satellite TV, wi-fi internet, music and video system, ping-pong table, a laundry area and private parking. The bedrooms have air conditioning. There is also a new tennis/volley/basketball court, as well as a fully equipped gym, and a small chapel. Spacious living room. Fully equipped open-plan kitchen and dining area. Master bedroom with en suite bathroom. 2 Master bedrooms with en-suite bathrooms. 1 Twin bedroom with en-suite bathroom. 1 Bedroom with bunk beds and en-suite bathroom. Guest WC. Staff bedroom and bathroom. 1 Double and 1 twin bedroom sharing a bathroom. New Suite, next to the Main House, available on request at extra cost. This comprises a very large double bedroom, a living room, and an en-suite bathroom. Maid service included (live in staff). Cook on request. An exceptional villa for rent is situated at Kabi, in the area of Koundouros, in the south of Kea island. It is just five minutes walk from a quiet and sandy beach, and 25 kms from the port of Kea. With large terraces on two levels, offering amazing sea views, the many facilities here include two swimming pools, a tennis court and a gym. Prices quoted are for 6 bedrooms. 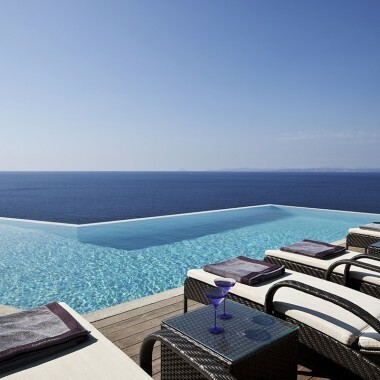 The additional new suite can be rented at an additional cost (€3500 per week in low season - €4200 in high season). 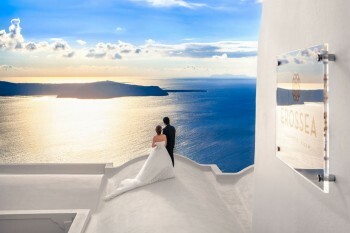 Looking for a perfect wedding venue in Europe?